After making a floaty light as air dress in white linen I've reverted to my usual style and made a close fitting sharp dress in a dark colour. 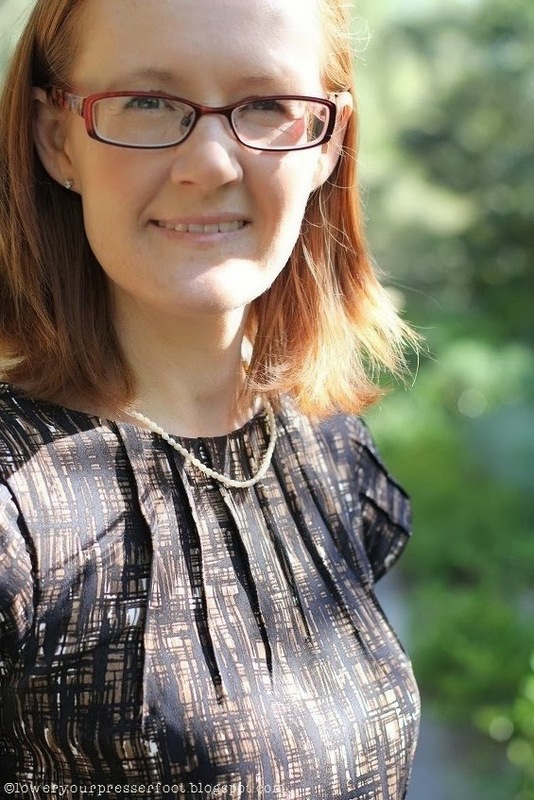 I used New Look 6968 which is now officially my absolute go to pattern for a fitted sheath dress to make my latest dress for work. Actually I've just noticed on the Simplicity site that this pattern is now discontinued which I'm a little surprised about because it is such a classic style, but I'll be doing my best to keep it's memory alive! There's not much more to say about this pattern really - invisible zip and a walking vent at the centre back seam, fully lined and a machine stitched hem because I was in rush to finish this Monday night so I could wear it to a big meeting at work on Tuesday! The stitching at the hem isn't too visible so I can live with it, even though I'd usually hand stitch it to make invisible. I don't think this will be the last New Look 6968 you'll see around here! I am the very model of efficiency this month I tell you! 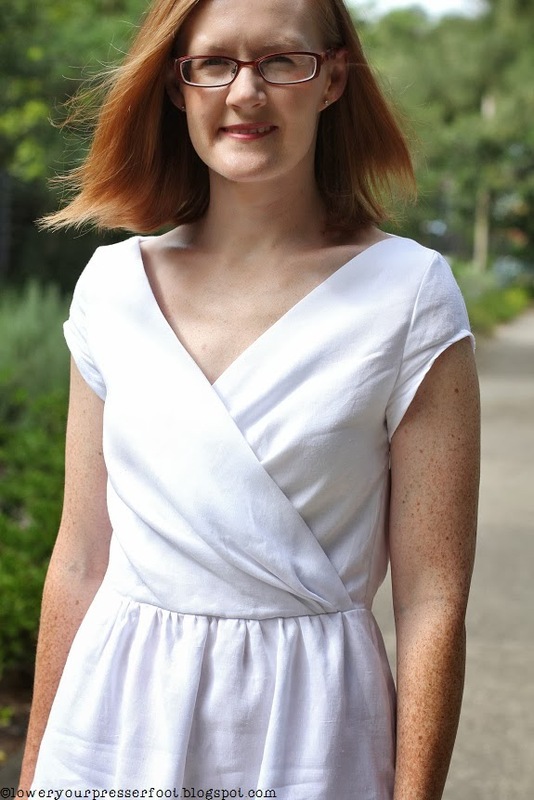 Not only have I finished my January Burda project within the month of January (the second Burda project I've made this month), but I also used this month's pattern as my entry into the Pattern Review Little White Dress contest. And I used some more fabric from the stash, so even if I don't rate a mention in the contest I'm already a winner. Of course if you want to vote for me I wouldn't mind at all! (You need to be a member of PR though and voting doesn't start until the 18 Feb). 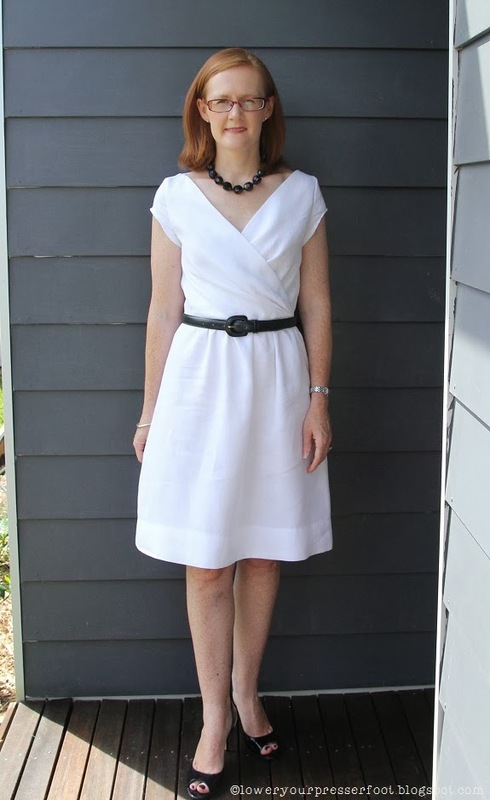 I made 1/2014 #107, a dress with a cross over bodice and a lightly gathered skirt from a crisp white linen I've had in my stash for quite a few years. I didn't make a muslin for this dress because I happen to have 5 metres of this linen, purchased in Bangkok many years ago (pre children - a lifetime ago!) and I figured that it would probably only be the bodice that may not work and anyway if it didn't work out first time I had enough fabric to cut out another. Happily though this dress worked out perfectly first time with no changes other than cutting out a size 34 at the shoulders and bust, flaring out to size 36 at the waist and using the size 40 skirt pattern piece so that I could have a few more gathers than the pattern. Usually I have problems with cross over bodices gaping open since I have a very small bust but not only does this bodice fit closely I think those pleats on the front pieces (they are on both front pieces) give a bit more body to my skeletal chest region. It does get a bit bulky there at the front waist seam because of those pleats meeting the gathers, so I'd recommend sticking to a lightweight fabric if you're thinking of making this dress. The back has two small pleats at the waistline instead of darts, which I think suits this dress ok as it's a casual summer dress but if I were to make this again in a more dressier fabric I would probably convert them to darts to get a nice close finish. As is typical with Burda patterns the skirt is about 5cm too long for me, but I left it that long so I could make a nice deep hem to give the skirt a bit of weight. I also knew that the hem would be visible because the fabric is still rather lightweight, so I decided to give the hem some visual weight too by top stitching the hem line with a triple stitch in a longer stitch - it makes the hem a feature rather a sloppy job. I'm not particularly liking those sleeves though - they sit a bit awkwardly and finish at a rather unflattering part of my arm. And even though I pressed the seam allowances down the flip up under my arms which you can just catch a glimpse of. If I were to make this dress again I would make the sleeves a traditional cap sleeve instead and make a facing or lining under the arm opening instead. And no I'm not doing the 'squinch' (a pose that is supposed to make you look more attractive in photos), it was either because of glare or my children being naughty behind the camera! After getting a bit cross a few posts back about the wrinkliness of cotton sateen you must all think I'm mad making something from linen! 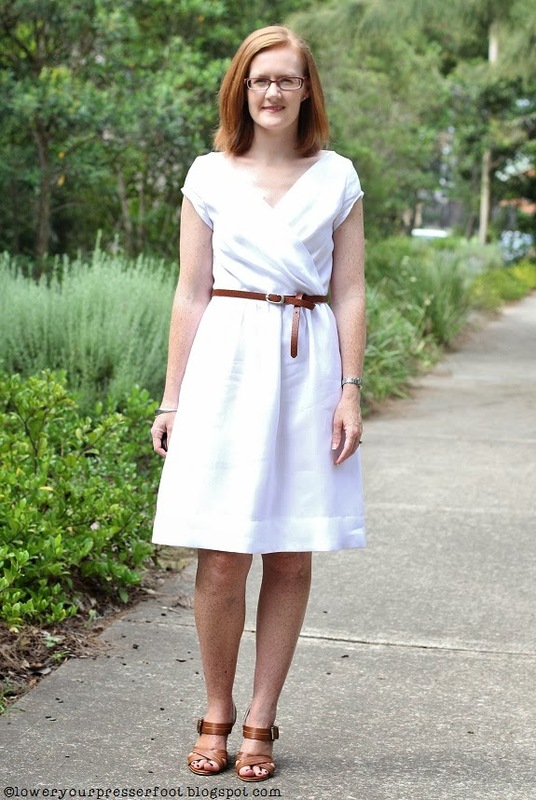 But the difference for me is that linen is expected to wrinkle, in fact it's the hallmark of linen and something about wrinkled linen screams summer outfit to me. I've never claimed to be consistent or to make sense all the time though, have I? Anyway I underlined all the pattern pieces with a white poly-cotton because the linen is rather lightweight and too sheer to be unlined, but also because I'm hoping that underlining it with a fabric with a bit of polyester content may help reduce the wrinkling a little. I didn't bother making an additional lining though because I still want this to be a light summer dress, and the bodice front has a fold over facing which gives a nice clean edge to the fronts. I decided to enter the Pattern Review contest on a whim after seeing this month's Burda magazine patterns and figuring I could kill two birds with one stone. I haven't entered a contest on there before, in fact I've really only become active on Pattern Review in the last year after letting my paid membership lapse for many years but I am trying to post more reviews in an effort to give back to the community there. The competition rules require a simple, classic style that could be worn for many years and dressed up or down. I think a dress with a surplice bodice and a gathered skirt is both simple and classic and I can see me wearing this for years to come, depending on how long the fabric stays this white of course! For day I chose to pair it with a tan leather bag, belt and heels and a wide brimmed white hat. 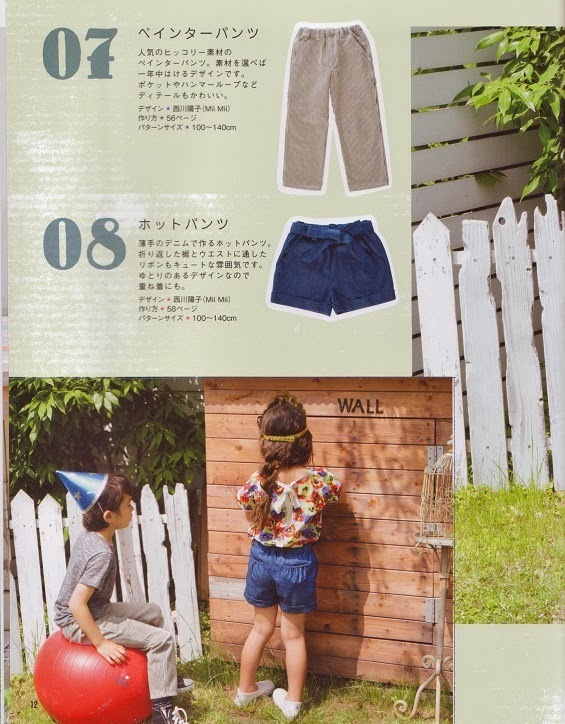 During summer I'm never without a hat outdoors so this outfit really is something I would wear, but only when I don't have my children with me because a white dress to those two is like a red flag to a bull. I would barely last a microsecond before they left a grubby mark on me! I found trying to style this for night time was a little more difficult because I probably wouldn't wear a loose fitting white dress out at night given that I have many other more sophisticated and colourful dresses already in my wardrobe. So I decided to go with classic black and white, pairing it with black peeptoe shoes, chunky black necklace and black belt. If only I had a classic Chanel camellia brooch to go with it (hint, hint husband!). So overall this pattern is a winner, it seems to be well drafted and the style is one that is fairly easy to fit because the cross over part can be crossed over slightly more or less depending on what you need (a larger bust would probably need a FBA though I'm not an expert in that area never having needed one! ), and the gathered skirt can just be drawn in to suit the finished waist circumference. Looks like my 2014 Burda challenge is off to a promising start. Thank you for all your lovely comments on my last post. Even though there was no common theme or consistency to what I made from the Burda magazine last year I'm glad it didn't turn out like rag bag collection! I've just finished sewing the hem on my January 2014 Burda project of the month, and now I'm hoping that the weather is fine on Thursday so I can photograph it. Yes, we've gone from heatwave to rain, neither of which are conducive to taking photos outside. But before I start on my 2014 year of Burda of the months, I thought I'd round up all the ones I made last year to see if there were any lessons to be learnt to guide me in the coming year. 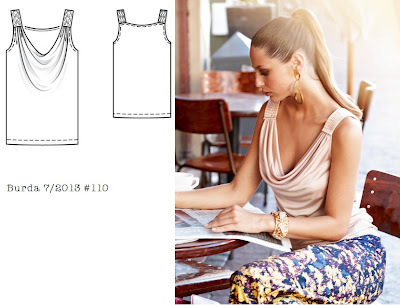 Probably not though, I tend to see my Burda pattern each month as an opportunity to try something new and different so I basically just go with whatever catches my eye. I love the fabric I used for this dress, a gorgeous blueberry coloured ponti knit purchased from Tessuti Fabrics at the first Sydney sewists meetup, but I find the dress a bit blah and have hardly worn it to be honest. I think it's mainly because I don't have anything to wear with it, and it gets really cool in my office so I do need a jacket of some sort, but also I don't think those horizontal seams across my bust and my hips are all that flash. And the zipper bulges a little at the centre back which annoys me. In fact I've already started unpicking this dress with plans to make it into something else - the fabric is too nice to languish at the back of the wardrobe. I listed in this my Top 5 least favourite makes of the year so no more really to be said - hardly worn, hard to style and not really me. At least the fabric was stash fabric that has now been used up. Lesson learnt: the hippy, boho look is not for me. I quite like this dress - it's sweet and simple, the fabric is a lovely colour and an interesting texture and it was deep out of the stash. The ribbons along the centre front darts probably start too high on the bust point, but I can live with it. The only problem is that I don't really have a jacket that goes with it to wear it more often. Lesson learnt: make garments that pair with at least one existing wardrobe occupant or sew something with it to make an outfit! This dress also featured in my Top 5 list recently, albeit on my Top 5 favourite makes of last year. It's a very a simple shape, in fact it's pretty shapeless but I've come to like the narrow neckline and cut away armhole sleeves. The fabric I used was a gorgeous piece from the stash that had been waiting for the right pattern to come along. Lesson learnt: a dress does not always need to be extremely close fitting to be gorgeous. So the June Burda project didn't actually get finished until mid July, but the dress turned out so lovely that it was worth the weight. This is another one my list of Top 5 faves for the year. And the fabrics were all from stash fabric. I can't wait for the weather to cool down so I can wear it again. I'd like to make a sleeveless version when I can settle on the right fabrics because it is a well drafted and well fitting pattern. This project was also finished in July, meaning I knocked out two Burda of the month projects in July. This is a rather simple cowl neck pattern, made from a silver lurex knit that had been in the stash for a while. I've only worn this top a few times, not because it's not lovely but because I mainly wear dresses when I go out. If I were to make this again I would make the straps from satin with some topstitching because I really like the way Quilt, Sew, Sew Sue's version turned out (review here). August's project was also rather late and not finished until mid September but again it was totally worth the wait because this might just be the project I'm most proud of making! Another one from my Top 5 fave list, the superb drafting of the pattern, perfect fit and the absolute loveliness of the raspberry red wool crepe I used all added up to the perfect wardrobe piece for me. I definitely have plans to make another one of these soon. Fabric also came from the stash, although it had only been in there for a few years so one of the more recent purchases. Another project not made in time! This skirt annoyed me so much while making it, that the only reason it wasn't thrown in the bin in a fit of anger is because it matches the jacket and I needed it to make a suit. The fit was funny, I didn't shorten it before cutting it out so the vents became non existent and basically I should have chosen another pattern. But it's done, and I wear it but I shall never use this pattern again! These were a surprise hit for me - for someone who hardly ever sews or wear pants I wear these floral ones in linen cotton quite a lot! The fabric (from the stash) does stretch out and sag a fair bit so the fit goes from being really good to about a size too big rather quickly, but worn with sandals and a tee or a shirt they've got that casual summer vibe happening. 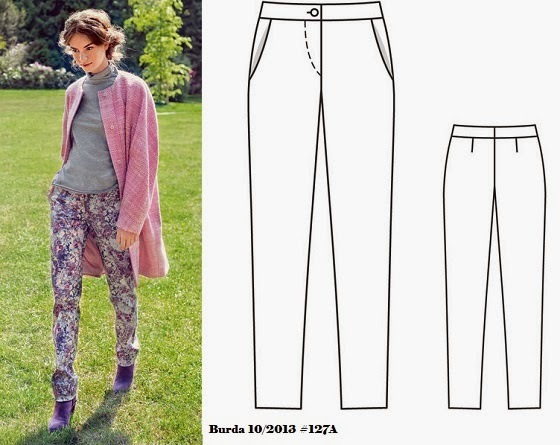 The legs of the pants aren't as narrow as the pattern or the model indicates though. 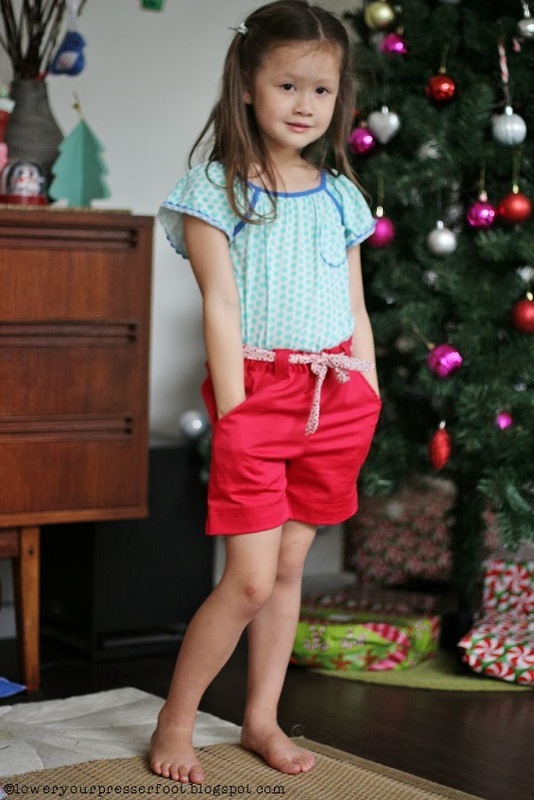 I also made a pair of shorts from this same pattern in a firm stretch drill which retain their good fit so for me these are a winner - possibly my TNT pants pattern? 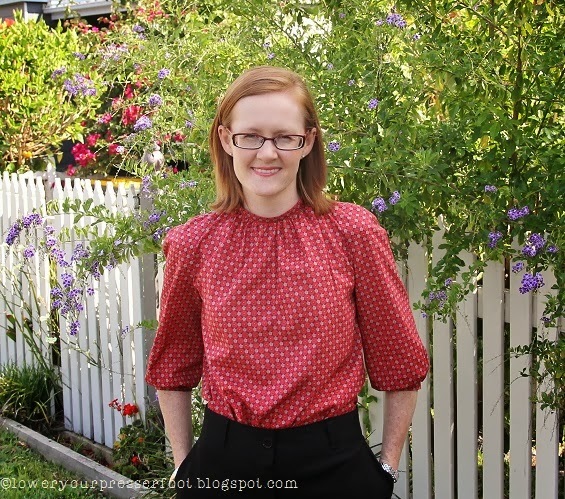 This one just scraped into the month of November, and while nothing special it has been a useful top to wear on the days when it's been really hot here but I need some coverage from the sun because the cotton voile (also from the stash) that I used is the perfect weight to achieve both. I need to take off the cuffs and make them a little wider though because they do ride up and feel a bit tight around my elbows after wearing it for a while. I do like the graceful gathers around the neck, and I may make another version with long sleeves in winter from an appropriately drapey fabric. One of my most recent makes (again being a little late and not made in the month of issue), a simple skirt style but made more interesting by the textured and printed fabric that came so far from the depths of the stash I can't even remember where or when I purchased it. The skirt is probably not going to go on high rotation in my wardrobe being so distinctive, and I'm not sure it screams corporate wear either but it's nice enough to be worn with casual flats and a white shirt out shopping without looking like I should be at work. Plus the whole point of making this pattern was to develop a TNT pencil skirt for future makes - this one still needs a little tweaking. 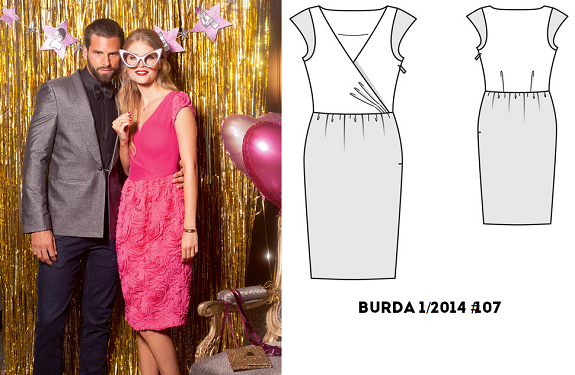 So yay to me for completing my self imposed Burda challenge for 2013, I can honestly say now that I got my money's worth from Burda subscription. Also yay for using stash fabrics for each project - not that there's a noticeable reduction in the amount of my stash, but I'm slowly chipping away at it! 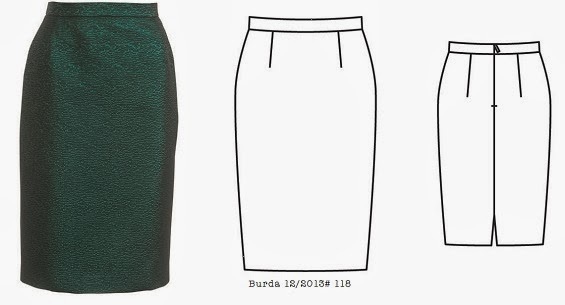 Burda of the month: 12/2013 #118 Floral Pencil Skirt - I blame Pinterest! 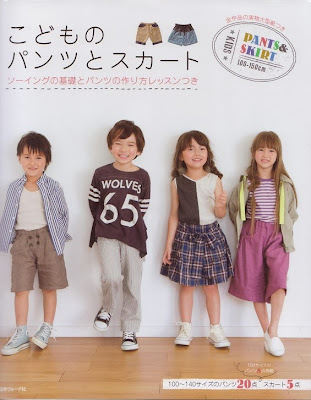 I know this is the Burda project of last month, but I only received the December issue a few days before Christmas when I was busy sewing other things, so it had to wait until January to get made. But happily the completion of this skirt means I achieved a 100% completion rate for my Burda challenge of 2013. And I've already traced off the January 2014 pattern and I spent today pre-treating the fabric, so I should be able to get 2014 off to a good start too! And as we all know sometimes it's the simplest patterns that take the most effort to work! I spent all day Saturday making a muslin and tweaking the fit. I think I got it about 90% right - but with a fitted garment like a pencil skirt I prefer to wear it a few times before making any other changes to make sure it's wearable because there's a danger that you can overfit it and have it looking perfect while standing still for photographs but can't actually walk in it! Indoor photographs today I'm afraid - I spent five minutes outside taking photos before I wilted in the extreme heatwave we're currently having and had to retreat inside. Of course those outdoor photos that I suffered for so much were no good because I had two children getting in the photo, running into me with their scooters and bumping the tripod. Those fashion bloggers with their photographer boyfriends and ample, uninterrupted time to take photos in beautiful locations have no idea of how much real life can get in your way sometime! The fabric is a beautiful cream textured cotton with a floral print that came from the dark recesses of the stash, so deep in fact that I've completely forgotten where or when I acquired it. All I know is that I have about 5 metres of it, and it's quite narrow which suggests that it's a vintage fabric because not many come in those widths anymore. The texture is a raised narrow chevron pattern which obviously it was cool before it's time given the obsession with chevron prints in recent years. My floral is obviously a much smaller scale and I didn't have a gingham check shirt in my wardrobe, and all my crisp white shirts have now worn out beyond the rejuvenating ability of bleach/soaking powders (another thing to add to my to sew list) so instead I decided to mix it up and wear it with my polka dotted white silk shell top I made last year. And I happened to have a coral coloured RTW blazer in a ponte knit that goes perfectly with the skirt so I haven't created an orphan (phew!). I didn't add the suggested 4cm hem allowance, took a further 5cm of length off and still have a 5cm hem to get it to sit at knee length. This skirt is extraordinarily long on me. I took out a wedge shape in the centre back seam under the zipper to get a closer fit and made a vented opening instead of a split in the centre back seam - I find the mitred vent to be a more professional and durable finish that just a split. I think I achieved a pretty good fit in the back (I just need to stand up a little straighter!). The pattern uses a long narrow rectangle folded in half for a waistband but instead I drafted one with a slight curve that is in three pieces sewn together at the side seams, and instead of folding it in half I made a facing for it from the same fabric. This type of waistband is better suited to my swayback. For the next version I need to sort out that puffiness and the front darts, and probably taper in the skirt at the side seams a bit because it's not as tapered as the line drawing from Burda suggests, but that will depend on how easy this version is to walk around in and do all the things one normally needs to in a normal day! So overall there's not much exciting about this pattern. 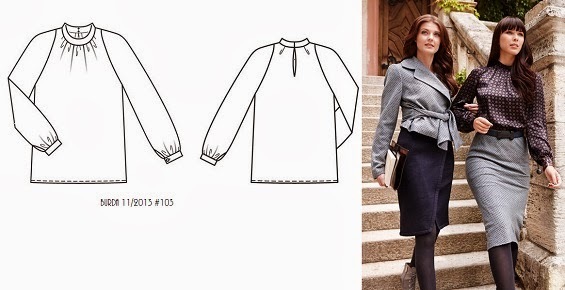 If you already have a pencil skirt TNT pattern then carry on, but if you don't then this is a good a starting point as any because pretty much any pattern will need fitting changes. But the other good thing about this project is that I can finally demonstrate to my husband the point of Pinterest - he's always asking me why I bother pinning images! Thanks for all your comments on the cotton sateen issue - I'm glad I'm not the only one that feels that way about it and I hope I've helped alert those of you that haven't used it yet what to expect. Badmomgoodmom made a good point about fabric quality being the key to how it wears, unfortunately you can't tell that until you've already bought and washed the fabric! I don't think I've ever seen Robert Kaufman fabric for sale here in Australia, but I certainly shall keep my eyes open for it now - fabric purchasing purely for the purpose of scientific testing you see! I'm officially declaring my love affair with cotton sateen over. Well, solid coloured cotton sateen at least, because I still have a few beautiful printed cotton sateen pieces in the stash that I still want to use but no longer will I be drawn in by the lustrous sheen, the smooth and firm fabric and the strong colours because I know that whatever it is made into will just become a wrinkly mess and that sheen will be lost after the first wash. It's possibly why I'm dragging my feet on finishing a white blazer I started last November even though I really want a white blazer in my wardrobe - it's made from cotton sateen that even though I've block interfaced I fear that it's going to look terrible when finished! So why am I being so emphatic about it this time? Well when I made New Look 6144, the pleated neckline dress in a glorious Kelly green cotton sateen that wrinkled the moment I lifted it off the ironing board, it was from some lesser priced cotton sateen bought from Spotlight (about $9.99/m I think). But I've just used some more expensive (and presumably better quality) cotton sateen in a deep red colour that I bought from the remnant table at Tessuti's last year, and sadly it wrinkles the same. So my highly unscientific deduction is that all cotton sateens probably wrinkle badly, no matter the price or quality. The printed cotton sateens wrinkle just as much of course, it's just that the prints usually hide the fact a little better. It's only a casual skirt so I can live with those wrinkles, plus it was so hot and humid up there in Queensland that practically everything looked wilted and less than fresh the moment you stepped outside! And what better shoes to co-ordinate with some red shorts than a pair of mum's red high heels? Happily I have managed to finish my December Burda project, thus successfully completing my Burda challenge of sewing at least one pattern from each magazine each month. I just have to photograph it , which I will do once I get the paint out of my hair and eyebrows - the good husband and I have been busy painting the outside of our house (eaves, gutters, window frames and weatherboards) as well as doing some landscaping and general tidying up. It's amazing how much can get done when the two kids are off at daycare! Thanks to all those who commented on my end of year wrap up post - I'm glad you all agreed with my fabourite choices, and a special thanks to those who even thought my least faves were still ok. And Mary from Thailand thank you in particular for your interesting suggestion on how to deal with the wrinkled green cotton sateen dress (by doodling on it with permament marker so it becomes a print instead) - what an amazing idea!